Saturday after a game of tennis we picked some more oranges and lemons in the little orchard next to the courts. 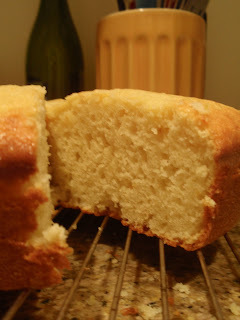 The lemons were more ripe this week and I was excited to use the fresh zest and make something delicious, like this recipe for Lemon Cake. I wish I knew what kind of lemons they were- maybe someday I'll find out. I made it last night and although delicious, I think it was best with a drizzle of lemon juice and confectioner sugar glaze. Next time I might take it out, poke some holes, and let the glaze seep through the cake as well.